On the third and fifth Sundays of every month, members of Monterey United Church of Christ forgo scripture readings, and sermon, to hear instead a tale from their collection of Godly Play stories, and then they wonder about it. The goal of Godly Play is to show how to be open to the Holy Spirit, the Creator, and the Redeemer all at once, and all the time, in every place. Based on the educational theories of Maria Montessori, Godly Play is a method of teaching the stories of Christianity and the language of Spirituality using materials that simply beg to be touched, manipulated, and interacted with. It is common way to educate children, but Monterey took it a step further and adapted the method for their adult worship. "Now that we have invested in many of these materials, we've found that Godly Play is uncanny in its ability not only to teach but also to engage," said Rev. Liz Goodman, pastor at the small, but vibrant, rural church. The adult members are not asked to draw or otherwise explore the classroom space, which would be the normal agenda in the children's version of the program. However, they do take the 'openness, wondering, and discovering' session seriously. 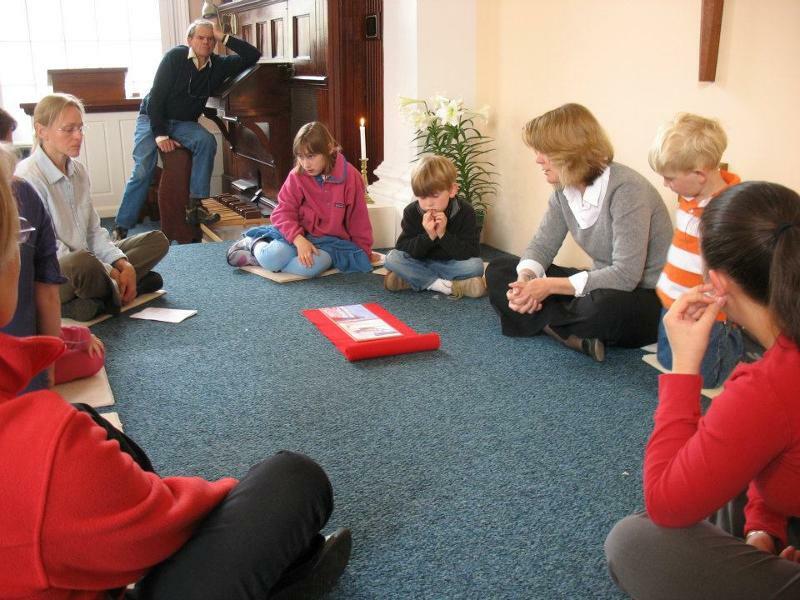 After the story is told using the tangible items, the members are invited to wonder about it, the watchword of Godly Play being, "I wonder...."
By way of example, the Sacred Stories, which are the earliest stories in the Bible (those in Genesis and Exodus), take place in what's called the Desert Box. This is a Plexiglas® low-set box on casters filled with play sand. The preface of stories that take place in the desert box explains that many important things happened to the people of God in the desert, so a small piece of the desert is kept in the sanctuary. Then, as the story unfolds, the story teller will move small wooden people from one end of the box to the other, as in the story of Abraham who moved at God's call from Ur to Hebron, or move them through a blue felt strip as in the story of the crossing of the Red Sea. Then comes the wondering, set off by questions asked one at a time: "I wonder what you liked best about this story. I wonder what strikes you as most important. I wonder where you are in the story, or what part of the story is about you. I wonder if we could take anything out and still have all the story we need." These are asked indirectly so as to invite any and all to participate, but not to require such participation. There's no "going around the circle," which might put people on the spot to have an answer whether or not they feel moved to speak. Instead, these wondering questions allow for one person's wondering to possibly inspire another to think something he or she has never thought before. "What accumulates, over the course of one Godly Play session and over the course of these now seven years of doing this," said Goodman, "is a deepening appreciation for just how profound and puzzling the stories of God and God's people truly are -- wondrous indeed!" Goodman believes that the program has been successful because Monterey is a small church (a typical Sunday will bring 20 or so to worship) in a small sanctuary with a flexible altar space where members can get physically close to the storytelling. In addition, participants in the life of the church tend to be open to new ideas and are able to manage spiritually the open 'wondering' time. A member or two haven't completely embraced the idea; but they still participate and support the service. Goodman advises that larger congregations may have some challenges in educating new members or visitors on protocol, managing the open time for too large a group, or keeping one person from taking control in the group, which tends to stifle the movement of the Holy Spirit and the freedom of people's wondering. Goodman reported that there's been a slow and cumulative effect in engaging people. "It's been said that we don't read the Bible, it reads us. That is, there's something about this library of stories, poems, prayers, parables, and passion that inform our humanity and inspire our living. If this is true (and we think it is) then those who seek the God we know in Christ could hardly do better than to inhabit the stories that the church has been given to tell. Godly Play helps to make this happen," she said. Lacking a critical mass of children, Goodman said she brought Godly Play to the adults at the encouragement of two members of the congregation, one who tends to safeguard the traditions of the congregation, and the other an innovator often pushing the congregation ahead. This seemed a graciously auspicious combination. The result, six years on, has been a realized "remembrance of Christ who told his followers that, if they were to enter the kingdom of heaven, they must become as children, whom we take in part to mean imaginative, curious, and wonder-full." Godly Play is about understanding how each of the stories of God's people connects with one's own experience and relationship with God. And at Monterey UCC, it doesn't matter what the age. You can reach Liz Goodman at the church office at 413-528-5850 or liz@goodman.md.